During the week I had a conversation that reminded me of one of my ‘past lives’. It was an interview for an ABC podcast talking about my experience with gestational diabetes. I was asked about my time working in the chocolate product development team for Arnotts, Australia’s largest biscuit (cookie) manufacturer. While I’m glad my career has evolved in a different direction, I look back on those days fondly. Working with chocolate was awesome fun. I learned so much. You know, important life lessons like tasting a variety of chocolate biscuits for breakfast meetings is not good for your waistline (I shudder to think what my blood sugar would have been like back then). More counter-intuitive was how different factors impact the way we perceive flavours and sweetness. We used to do our tastings ‘blind’, so no one knew what the differences were. The results frequently surprised me. There were many more ‘levers’ I could pull to increase the deliciousness of a particular product than just adding more sugar. I’ve been super grateful for those lessons while creating the recipes for my new sugar-free baking book. In fact, I wouldn’t have been able to successfully transition to baking without sugar without my Arnott’s experience. There’s a reason why most sugar-free treats don’t live up to expectations. It’s not easy to replace sugar. But as I’ve learned during my journey with gestational diabetes and now type 2, it is possible! So today I wanted to share some of my ‘secrets’ so you can make your baking taste better too. 1. Use sweet real food ingredients. There are plenty of real foods that taste sweet without being packed with sugar. Some of my favourites are berries, coconut (especially coconut oil), pears, apples, stone fruit, carrots, prunes and dark chocolate. Very occasionally I use dates or bananas but I know they pack a pretty big sugar-punch so treat them with the caution they deserve. What I don’t do is use honey, maple syrup, coconut sugar or (heavens forbid) brown sugar and pretend to myself that because these sweeteners are ‘natural’, they’re good for me. Sugar is sugar people. For me these sugars masquerading as ‘healthy’ is actually worse than plain old white sugar. They’re all going to have the same impact on your blood sugar. 2. Master the power of seasoning. Just as in savoury cooking, it’s super important to get your seasoning right when creating sweet treats. Generally salt balances out sweetness so using less salt will make things taste sweeter, without any actual extra sugar. So I use unsalted butter and avoid adding anything salty. There is a special (and very important) exception to the no salt rule… Chocolate! Salt masks sweetness but it also masks bitter flavours like those found in dark chocolate. This is why salted chocolate can actually appear to be sweeter than the same chocolate eaten without salt. Vanilla is my favourite way to increase the perception of sweetness without adding actual sugar. I use both real vanilla beans and vanilla extract (which I make myself by soaking vanilla beans in vodka). But there are plenty of other options. Cinnamon, fennel and star anise are all spices which add the perception of sweetness. Licorice root also does the same. 4. Use a natural sweetener. When I’m not able to get enough sweetness from following the ‘tricks’ above, I reach for my favourite natural sweetener, pure stevia powder. I like stevia because it comes from the stevia plant and doesn’t contain any sugar or carbs. And when used sparingly, I like the taste. BUT I know it’s not for everyone. If you don’t like stevia, it’s OK! One of the best parts about pure stevia is the only function it provides is sweetness. This means that for recipes based on pure stevia powder, it’s easy to substitute your favourite sweetener (or even good old sugar) just based on taste. 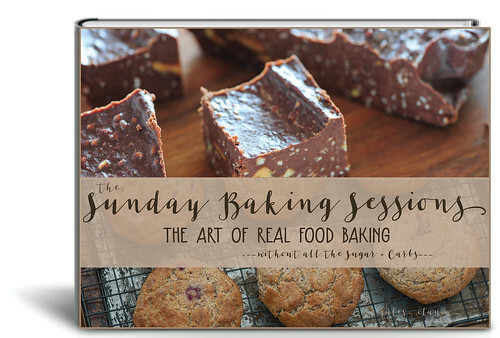 Like to discover more tricks for sugar-free baking without sacrificing the ‘YUM’ factor? Then check out my latest eCookbook! 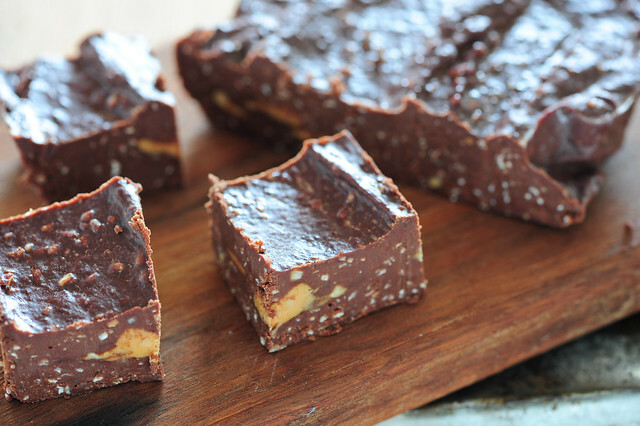 Fudge isn’t something you’d normally associate with healthy treats. But this version is super special, with no added sugar and hidden ‘fiber’ in the form of oat bran. I love how the little flecks remind me of the nougat ‘bits’ in Toblerone chocolate. 1. Bring coconut milk to a simmer in a medium saucepan. Meanwhile, line a loaf pan with foil or baking paper. 2. Remove from the heat and add the chocolate. Stand for a few minutes so the chocolate melts. 3. Stir in the peanut butter, vanilla and oat bran (if using). I like to leave a few chunks of peanut butter in the mixture. 4. Transfer fudge mixture to the prepared tin and refrigerate for a few hours, or until set. 5. Chop into small squares. 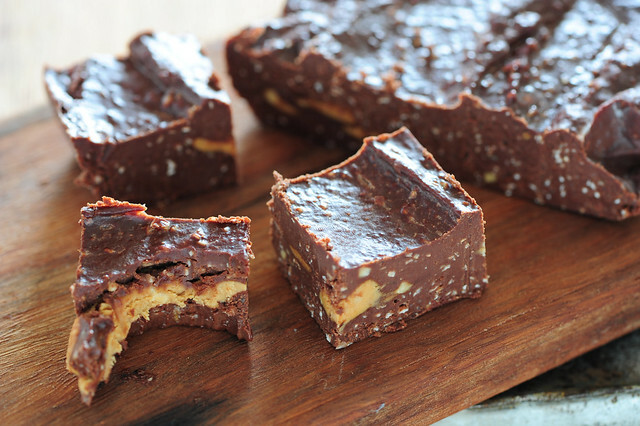 nut-free – just skip the peanut butter. no coconut milk – replace the coconut milk with regular whipping cream. fiber plus – double the level of oat bran. gluten-free / no oat bran – skip the oat bran or replace with psyllium husks, chia seeds or linseeds (flax seeds). super crunchy – mix in a handful of roasted peanut halves. different nuts – use your favourite nut butter – all nuts love chocolate! lower carb – use higher cocoa solids chocolate (90% is great). You might need to add a little sweetener but then again you may not. Can be kept for months in an airtight container in the fridge. Keeps for years in the freezer. ps. Don’t tell your family and friends these recipes are good for them! This sounds amazing! I can totally see how it would taste great without the added sweetener. But…. doesn’t 70% dark chocolate have some sugar in it? Jules, after reading this post I have a question: I’ve been reading a lot about nutrition, and one of the things I have learned is that if you taste a sweet flavor, your body expects the calories to go with it. That physical expectation can send you in search of more calories to satisfy the experience of sweetness. I know that this applies to artificial sweeteners, and the question I have is whether the same applies to Stevia, given that it is natural. Any ideas about that? I am fortunate enough to be not diabetic, but sometimes I like to control my calorie intake by substituting Stevia for sugar. And you’re right, the first part of our insulin response happens when we see / smell the food. I haven’t seen any research on this but I suspect you’re going to get the same initial response from stevia sweetened treats as you would from anything else. BUT when you actually eat the stevia sweetened cake etc it’s not going to impact your blood sugar in the same way as if there was actual sugar there. Which is a big benefit but it’s important to remember this link and not go crazy because something doesn’t contain sugar. Eating too much cake isn’t a good idea even if there isn’t any sugar. There is research showing that artificial sweeteners cause weight gain and the mechanism appears to have something to do with the way they interact with our gut microbes rather than this first phase insulin response. As far as I know there isn’t any research on stevia showing the same problems. This looks fabulous and I’ll definitely be making it. Jules I love the way you write. I get so many newsletters each day and skim over them. I always take the time to read yours, because they are so enjoyable to read and the recipes are healthy and very achievable. Hi Jules! I saw this post on your Instagram and knew I had to come over and give it a try! My lady loves desserts of any kind, but especially anything with peanut butter and chocolate in it! My question is: coconut milk vs. coconut cream…. I’ve had trouble with this in the past and can never seem to get it right. Is coconut milk the solid stuff on the top of the can? Or the thinner stuff in the bottom of the can? And if it’s the thinner bottom stuff, does that mean the thick stuff is coconut creme? Which do I want for this recipe? I assume the creme since your substitution calls for heavy whipping cream… Haha, clearly I’m lost! While I’m here, I just want to say that I absolutely adore your blog and your meal subscription! You’ve made cooking fun and manageable for me. Thanks for everything you do! Is there a pure stevia brand that you recommend? I am anxious to try the sugar free recipes.